On the outskirts of Berlin, there is a famous old park surrounding a lovely and equally famous little Schloss, and the whole thing is called Schloss Park Tegel. 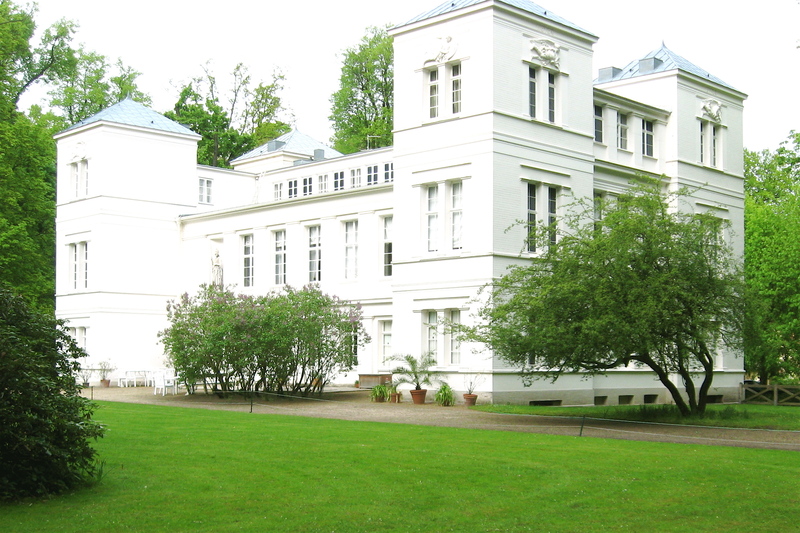 I have a rather personal connection to this place in the person of one of my direct ancestors, the redoubtable and very honorable Gottlob Johann Christian Kunth, private tutor and general factotum to the von Humboldt brothers, Alexander and Wilhelm. In honour of his lifelong devotion to the family, there was said to be a large and impressive memorial gravestone with his name somewhere in the park. Or so my father always said. 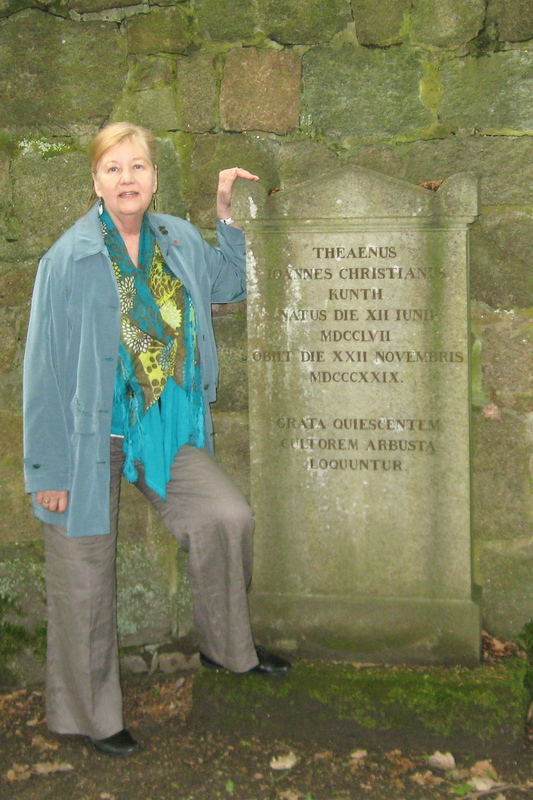 He was extremely proud of this ancestor, but until this visit to Germany, I had steadfastly ignored him. But then again, this character keeps showing up in novels; most recently in Die Vermessung der Welt, by Daniel Kehlmann; a novel chronicling the exploits of Alexander von Humboldt and Gauss, their eventual meeting as old men and the activities that consumed them. So on a recent and rare trip to reconnect with my German roots, I decided to pay my respects and off we went, my cousin Lore, her daughter Charlottte and I, on a dreary day in May, to search for my ancestral roots in the park. To our surprise, there was a large and apparently quite new memorial stone with a shiny brass plate and the name of my great great great great grandfather engraved on it, right in front of the park, almost on the sidewalk. But finding the grave marker was not nearly as simple. We meandered through the very large estate, looking in vain for directions. All we found was a huge and very formal mass grave for several generations of the von Humboldts, who at some point turned into the von Bulows. No sign of my ancestor. We returned in the general direction of the Schloss, where we encountered a sign strung across the wide walkway which announced: Eintritt Verboten. Hmm. The only way out of the park was past the sign, so we gingerly walked around it and kept advancing towards the Schloss. It appeared to be deserted, but just like in a bad movie, almost out of nowhere, a tall, distinguished looking older gentleman in a most ungentlemanly rage, swooped down on us. “How dare you violate private property; begone, get out of here, now!” he shouted (in German). I almost expected him to shake a fist at me, but he actually didn’t do that. Being Canadian, I was not about to be sent packing in this ignoble manner, so I kept advancing towards him, explaining in soothing tones who I was and what I was looking for. Somewhat perplexed, we trundled back the way we had come and after some more looking around, actually found the site in its own grove, with a large impressive looking stone engraved in Latin. My cousin and niece, both Latin scholars apparently, began arguing over the true meaning of the engraved words, while I marveled that we had actually found it. After the obligatory picture taking, we departed. I left to visit other relatives, but my cousin Lore started sleuthing on the Internet and discovered that the angry gentleman was none other than a direct descendant of Wilhelm von Humboldt, named von Heinz, the current owner of the Schloss and as pictures proved, he even looked every bit as stern and humourless as his famous ancestor. She then turned our collision in the park into literature on her blog, imagining a polite discussion about it as it might have happened if our ancestors had been present at the scene—which indeed they might have been. I was delighted and bemused. But then her son, my nephew Dietrich Brueggemann, a young up and coming director in the German film industry, heard the story and realized he knew someone by the name of von Heinz. She turned out to be none other than his niece! And promised to have a little talk with her misanthropic uncle. Next time I’m in Germany, I’ll put it all to rights and re-shoot the scene with a happy end. The question is, will I ever get back there? Given the uncomfortable and arduous journey and my advancing age, I doubt it.